Mazda sport utilities come in three different sizes. 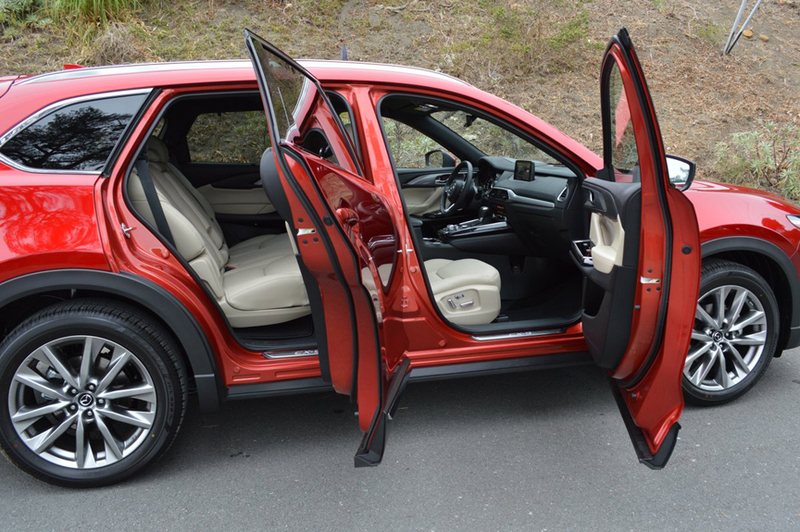 At the lowest price point (starting at $21,500), the CX-3 offers 146hp in a 168 inch long body that seats 5. Next step up is the CX-5, which starts at $25,500, with a diesel engine (174hp) or a gasoline motor (187hp). This one measures 179 inches, and also transports 5. Top of the food chain is the CX-9 we drove for a week. This one starts at $33,000; has a gas fueled engine good for 227hp, measures 200 inches in length, and seats up to 7 in 3 rows of seating. All 3 Mazda SUVs are available with front wheel drive (FWD) or all wheel drive (AWD). The specific version of CX-9 we tested was the AWD Touring model, which cost $42,640; making it the most expensive Mazda SUV currently available. The turbocharged 227hp "Skyactive" four cylinder engine also produces 310lb.-ft. of torque, and sends its output to all four wheels via a 6 speed automatic gearbox. Although the otherwise sporty CX-9 includes manual shift control via a separate gate on the center console, Mazda, surprisingly, does not provide steering wheel paddles for this function. When in manual mode, you bump the console stick forward to downshift and backward to upshift. Although the CX-9 is tow rated at 3,500lbs, the turbo engine's somewhat peaky performance curve undercuts the seamless torque you need for smooth towing. Part of the problem lies in the 4,585lb. curb weight of this vehicle, which produces a dumpy horsepower-to-weight ratio of 20.1lbs. per horsepower. Not exactly underpowered, but certainly not overpowered. In defense of the CX-9 as a tow vehicle, however, Mazda does offer standard trailer sway control. Handling is a strong point of the CX-9. The first item you notice on the center console is a "Sport" button which, when engaged, quickens accelerator response. Spirited driving is the hallmark of Mazda products. Consequently, the company has always placed a premium on precision of operation. To that end, they have equipped the CX-9 Touring with the following high performance enhancements: independent front and rear suspension (a feature notably lacking on many lesser SUVs), front and rear stabilizer bars (ditto), and "G-Vectoring Control" which is new to the CX-9 for 2019, and helps distribute power from side to side in an effort to preserve your intended path of travel. At all 4 contact points, Bridgestone Ecopia H/L 422 tires (255/50R20) stand ready to grip the road with tenacity. Despite the CX-9's substantial size and elevated ride height, we never experienced loss of traction when pushing this Mazda hard through back road bends. The Touring package is most appreciated when you climb into the airy, spacious, high windowed cabin and slip into the heated and cooled, leather trimmed front seats. Both front seats offer power assist for positioning, and the driver's side includes a 2 slot memory for future recall. Dash and door trim includes "genuine" aluminum inserts, and the privacy of second row passengers is preserved by roll-up window nets. The tight third row seats are best reserved for young children, but at least that extra space is available when needed. With a slip flip of a side lever, we flattened both second row seats to convert the CX-9s interior into a storage compartment big enough to house a mountain bike with room to spare. Maximum cargo volume is 34 cubic feet with 2nd and 3rd row seats folded flat. The only catch on bike loading is lack of a flap to bridge the gap between the second and third row seats. This proves to be just the place to get your bike pedal stuck. 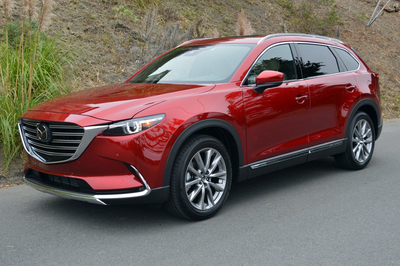 Although the CX-9 misses out on a recommended rating from Consumer Reports thanks to past reliability issues, the latest iteration we drove has claimed the top rung of the enthusiast's selection ladder. This SUV is conspicuously understated but handsome from the outside, plush but genteel on the inside, and a revelation to push through back road bends for those who appreciate its fine handling qualities. 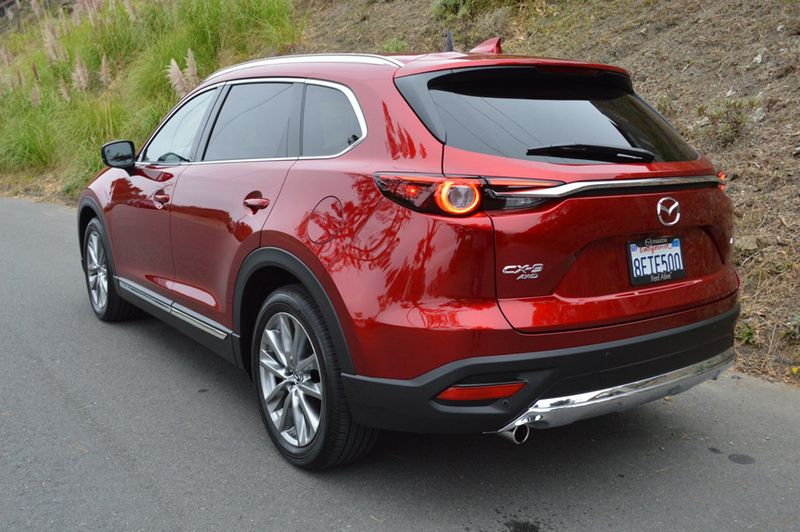 As Mazda says, "Why did we obsess over improving every detail of the CX-9? Because you wouldn't expect anything less from an SUV built for drivers."